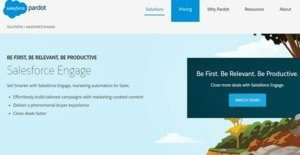 Salesforce Engage is a marketing automation solution from Pardot that is powered by Salesforce. It bridges the gap between marketing and sales by aiding transparency and facilitating information across both teams. With the platform, marketing can empower salespeople to develop, execute, deliver and track their own personalized lead nurture campaigns. It gives your sales reps the power of marketing-curated content and insights through pre-built email templates, real-time alerts, as well as analytics and reports using interactive, graphical dashboards. With Salesforce Engage, you get a full view into a prospect’s activity history, including what marketing assets a prospect has engaged with, what emails the prospect has opened and read, and what events have been attended, among others. The solution helps your team optimize their time and maximize their effort by concentrating on prospects likely to buy, and automating prospect nurturing early on in the customer journey. The marketing automation for sales enables your team to sell smarter and close deals faster through by effortlessly building tailored campaigns through content optimized for marketing. Salesforce Engage capitalizes on its name “engage” to highlight the benefits and advantages you gain through the use of the solution. You’ll be able to deliver the right message every time with a library of marketing-approved templates to nurture your prospects. According to Salesforce, this method results in 38% increase in prospect engagement since it helps salespeople reach prospects first through rich context and insights that drive deals forward. With real-time alerts based on how prospects interact with your emails and content, your sales teams are able to engage with prospects quickly. Salesforce says this notification system increases sales revenue by 34% as teams are able to respond faster to any prospect interaction. You get to uncover trends that close deals faster with interactive dashboards that allow your reps to monitor and control their campaign success. Having important engagement metrics, you are the position to better understand the factors affecting your pipeline and do adjustments to ensure that leads and prospects move through smoothly. The capability of the solution to provide you deep visibility into your prospect’s digital engagement is delivered natively in the tools that your teams currently employ such as Gmail and Outlook. You can send targeted emails from the email interface you use while automatically logging all interactions in Pardot and Salesforce. You’ll be able to engage prospects on the go and sell from anywhere with the solution’s mobile capabilities. It lets you respond at any moment of engagement, nurture leads, and drive campaigns direct from your mobile device. Each company is different, and might need a particular type of Marketing Automation Software solution that will be designed for their company size, type of customers and employees and even particular industry they support. You should not count on locating an ideal services that is going to work for each business regardless of their history is. It may be a good idea to read a few Salesforce Engage reviews first and even then you should remember what the service is intended to do for your company and your staff. Do you require an easy and straightforward service with only elementary features? Will you actually use the complex tools needed by experts and big enterprises? Are there any particular features that are especially practical for the industry you work in? If you ask yourself these questions it is going to be much easier to get a solid service that will fit your budget. How Much Does Salesforce Engage Cost? Salesforce Engage for Pardot goes for $50/user per month billed annually. Licences are on a one per person basis and offered in all Pardot editions with Salesforce Engage, and in the Professional, Enterprise, Performance, Unlimited, and Developer Editions of Salesforce Cloud. We realize that when you make a decision to buy Marketing Automation Software it’s important not only to see how experts evaluate it in their reviews, but also to find out if the real people and companies that buy it are actually satisfied with the product. That’s why we’ve created our behavior-based Customer Satisfaction Algorithm™ that gathers customer reviews, comments and Salesforce Engage reviews across a wide range of social media sites. The data is then presented in an easy to digest form showing how many people had positive and negative experience with Salesforce Engage. With that information at hand you should be equipped to make an informed buying decision that you won’t regret. What are Salesforce Engage pricing details? What integrations are available for Salesforce Engage? Salesforce Engage connects with Salesforce CRM and Salesforce Mobile, and integrates with email clients Outlook and Gmail. If you need more information about Salesforce Engage or you simply have a question let us know what you need and we’ll forward your request directly to the vendor.